PASADENA >> A gunman carjacked a Fontana man of his rental car in a residential neighborhood in Pasadena on Friday afternoon, police said. The victim, a 23-year-old man, was sitting in the rented car at Hurlbut Street and Jane Place about 4:25 p.m. when the carjacker approached on foot and brandished a handgun, Pasadena police Lt. Mark Goodman said. “The suspect demanded the victim exit the vehicle. The victim got out of the vehicle, at which time the suspect got in and drove away,” according to Goodman. The stolen car was a cream-colored, 2017 Hyundai Accent. Police described the carjacker as a black man of unknown age, about 6 feet tall, of thin build, with dreadlocks in his hair and wearing all black clothing. Anyone with information is urged to contact Pasadena police at 626-744-4241. Tips may also be submitted anonymously to L.A. Regional Crime Stoppers at 800-222-8477. RIVERSIDE >> A suspected serial bank robber the FBI is calling the “We’re Listening Bandit,” accused of six bank robberies and attempted bank robberies throughout Los Angeles, Riverside and San Bernardino counties, is behind bars after police in Riverside found and arrested him this week, authorities said. Jeffery Tuli, 33, of San Bernardino is suspected in six bank robberies and attempted bank robberies throughout the region, as well as two additional robberies in Moreno Valley since late-June, according to Moreno Valley police and FBI officials. Moreno Valley police tracked him down and arrested him about 3 p.m. Thursday in a parking lot in the 8900 block of Trautwein Road, Moreno Valley police Sgt. Aaron Kent said in a written statement. “Several items of evidence were located in Tuli’s vehicle,” he said, but did not elaborate. Tuli began his alleged crime spree in on June 21 with a failed robbery at a Wells Fargo branch in Highland, FBI spokeswoman Laura Eimiller said. He then robbed a Fontana U.S. Bank on July 9 and a Moreno Valley Chase bank on July 12, Eimiller said. The “We’re Listening Bandit” then tried, but failed, to rob a Whittier Wells Fargo branch on July 13 before successfully robbing a Wells Fargo in Moreno Valley on July 14, and a Riverside Union Bank on the same say, she said. The one-man crime wave continued Wednesday, when Tuli robbed two people at gunpoint as they sat in a car in Moreno Valley, Kent said. Twenty minutes later, he robbed a Moreno Valley business at gunpoint. 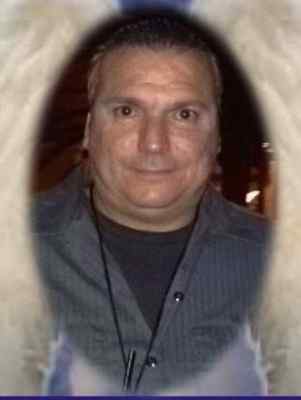 Moreno Valley police identified Tuli as a suspect in the crimes in their jurisdiction and learned that the same man was sought in connection with other robberies throughout Southern California, Kent said. 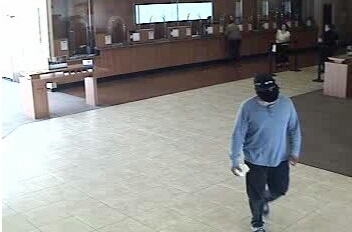 The “We’re Listening Bandit” earned his moniker due to demand notes passed to tellers during the bank robberies, threatening that he or “others” will be watching the victims, Eimiller said. According to Riverside County booking records, Tuli was being held in lieu of $1 million pending his initial court appearance, scheduled Tuesday in the Riverside Hall of Justice. PHOTOS: [TOP] Booking mug of Jeffery Tuli, 33, of San Bernardino, courtesy of the Riverside Sheriff’s Department. 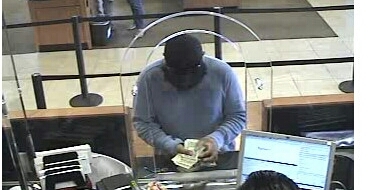 [BELOW] Bank surveillance photo courtesy of the FBI. The FBI is offering a $5,000 reward for information leading to the arrest and conviction of a fake beard-clad serial bank robber dubbed “The Bluto Bandit” who has robbed or been spotted at six banks throughout Los Angeles and San Bernardino counties over the past week. The bandit has robbed Chase bank branches in Pasadena, Duarte and Ontario, and has been seen “casing” other branches in Monrovia, Chino and Fontana, according to FBI spokeswoman Laura Eimiller. In each case, the bandit wore a thick, black, curly fake beard, prompting investigators to nickname him the Bluto Bandit, inspired by the bearded villain in the “Popeye” comic strip, Eimiller said. He robbed a Chase bank at 3870 Foothill Boulevard in an unincorporated county area near Pasadena about 2:35 p.m. Tuesday, then robbed another Chase bank at 1000 Huntington Drive in Duarte about half an hour later, Eimiller said. The robber was also seen casing a Monrovia bank in between the two robbers, as well as a Fontana bank later in the afternoon. In the Pasadena and Monrovia heists, the robber quietly approached tellers and handed over notes demanding cash, Los Angeles County sheriff’s Lt. Loy McBride said. “He didn’t really even speak,” the lieutenant said. But the serial bandit’s crime spree began June 10, when he robbed a Chase bank at 1070 N. Mountain Avenue in Ontario, according to the FBI. He was spotted casing a Chino Chase bank two days later. Investigators described the robber as a Latino man, 28 to 30 years old, about 5 feet 9 inches tall and 195 pounds. In all of the crimes, he wore his fake beard and a blue, long-sleeve Pendleton-style shirt. No weapon has been seen during the crimes. Anyone with information is asked to contact the FBI Los Angeles Office at 310-477-6565. 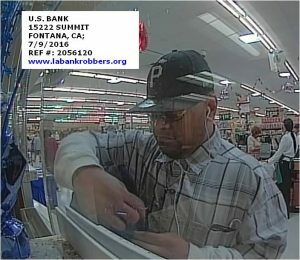 PHOTOS from robberies in Duarte (above) and unincorporated Pasadena (below) courtesy of the FBI.